I am really looking forward to diving into logic with my 7th grader next year. Logic is one of only two subjects I nearly failed in college, it made absolutely no sense at the time. However, since beginning my homeschooling research when my oldest was just 4-years-old I’ve been fascinated by the subject. We’ve spent countless hours in the past 7 years completing logic puzzle books together, and we both love the challenge logic puzzles present. 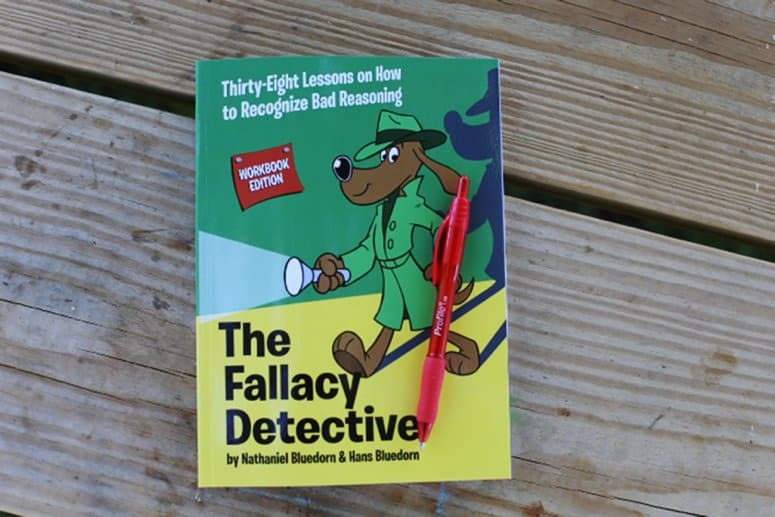 Timberdoodle Co sent The Fallacy Detective: Thirty-Eight Lessons on How to Recognize Bad Reasoning by Nathaniel Bluedorn & Hans Bluedorn for Miriam and I to review. 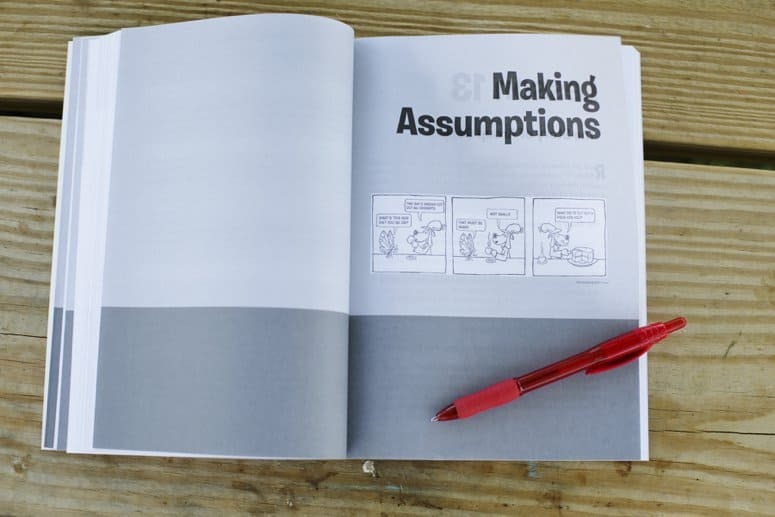 This book provides 38 lessons on recognizing bad reasoning for children and adults ages 12 and up. It is recommended that you work through this book with at least one other person, as the discussion aids in understanding. I’m looking forward to logic alongside my 7th grader this year! We should easily finish the book in one school year, by completing a little more than one lesson a week. After looking through the book and getting started on the first few lessons for this review I am certain finishing in one year will be no problem. We have trouble putting this book down! I’m thinking we will finish the book in half and year or less at the rate we are going. This Fallacy Detective is the workbook edition, and I really like the format. Solving problems and completing exercises right in the book is so convenient. Miriam and I both find the chapters both easy to read and engaging. Completing lessons definitely doesn’t feel like school work, and we both look forward to sitting down to discuss our answers. In fact, I find that the lessons often lead into other discussions about what we believe and why. In the teen years those discussions can be difficult to start, so I really love how we naturally move into those topics! The book begins explaining what a fallacy is. (It’s an error in logic.) The following lessons teach different types of fallacies, and ways to recognize those fallacies. Miriam is a fan of the use throughout the book of Peanuts, Dilbert, and Calvin and Hobbes cartoons. 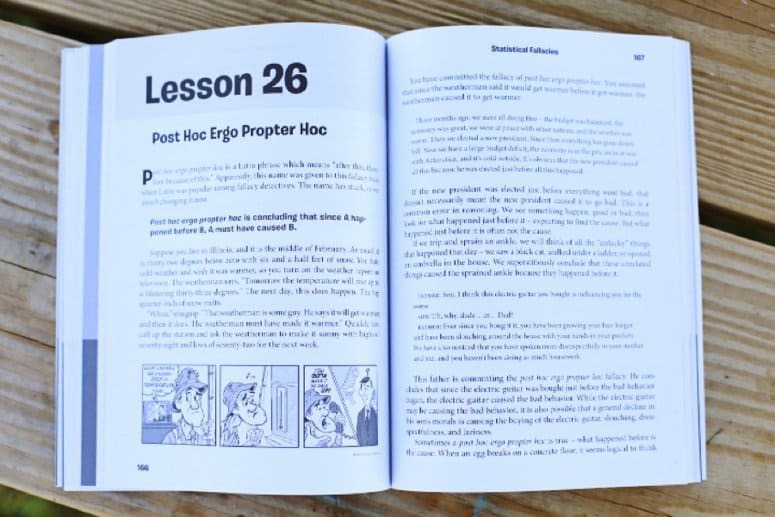 The book also includes instructions for playing The Fallacy Detective Game, which we look forward to playing as we have more students old enough to study logic. My only worry with completing this book- and the study of logic in general- is that I’m giving my children the tools to win arguments… and if my lack of logic ability still stands, they will likely win most of the time! The teen years could definitely be more challenging with a child who understands and can apply logic based arguments! Seriously though, I am super pleased with this book. It’s a fun way to start the study of logic with the added bonus of being budget friendly. Thanks for this review! I have been considering buying this book for a few years. I think I need to finally take the plunge.